Invader is a street artist who forms the classic arcade game character using mosaic tiles. The art is cool because it is simple and at first glance seems to completely fit in with the landscape. It is only upon closer inspection that you are left scratching your head as to why there is a video game icon in the middle of a building or city street. Learn more about Space Invader here. Man, oh, man. Barack Obama's acceptance speech tonight. I can't remember the last time I was this excited/nervous to hear, you know, a speech by a politician. I think the excitement first started building this morning, when I got into the office and fired up Bill Clinton's speech from last night (view it here). I was really saddened and disappointment by his behavior during the primary season, but last night I thought he really came through. Then, the excitement continued to build, as I came across this NY Times piece, which basically says that some Democrats are concerned that Barack, speaking in front of 75,000 tonight, will look too much like a rock star and not somebody with whom we can relate. Note: Democrats have lost the last two presidential elections and they should have won them both. Therefore: I am so over -- and I presume many of you are with me on this -- what Democratic strategists have to say. They should probably just shut up now and listen to Barack. In closing, I have been listening to the following OK Go cover of The Zombies all morning, and imagine I'll listen to it all afternoon in anticipation of the big speech tonight. You should do the same. When you're done listening to that, may I suggest that you mind an anniversary by listening to this? Barack's speech is anticipated, but my god, this thing. I still can't get through it without literally crying and shaking. But they are tears and shakes that are needed. We briefly touched on this in yesterday's post, but wanted to wait until we had some more pictures before we went into fuller detail. Anyway. Cinema Tuesdays. It's put on by Flux. A little more info can be found here. It's a Tuesday movie screening. It's free and open to the public. All you have to do is RSVP ahead of time. Then you show up, they have a free Belvedere open bar, free finger food, music, usually people associated with the film on-hand to chat with the audience and, most impressively, countertops and countertops full of free candy. Above all else, we are seekers of value, and we're pretty sure you'll be hard-pressed to find better movie-going value in Los Angeles, if not the whole country, than Cinema Tuesdays. Seriously, if you went to the ArcLight -- and we love going to the ArcLight -- and bought two movie tickets, two drinks from the bar, two bags of candy, and popcorn, it would be, what, probably $50-70? At Cinema Tuesdays? Like $4, to tip the open bar tender. Awesome. Another really cool thing about Cinema Tuesdays is that, as mentioned in yesterday's post, it is housed in the Montalban Theater, which for the time being, has been handed over to a bunch of artists, so in the theater foyer there is a bunch of cool, random stuff to view. Our friend said -- and we agreed -- that it reminded her of the Ron Pippin show from last year. Here is that cool Geoff McFetridge wall paper that lines the upstairs of the theater. Here it is wearing its party pants. This week's showing was of Assassination of a High School President, which is set to be released next March. The theme for the evening, fittingly, was prom. Hence the party look. Last week, the theme was Olympics. A slightly different vibe. But fun both times. Brett Simon, director of the film. We didn't completely love the film, but as the credits rolled, our friend turned to us and said it was like an episode of My So-Called Life. This was a perfect description. It was like watching a season of My So-Called Life and somehow, that realization made us like the film more. Of course, it wouldn't be a proper post without a random Obey sighting. The Artwork of Geoff McFetridge. McFetridge is an LA-based artist/graphic-designer. We first came across his work while checking out the Nike Sportwear installation store at the Montalban Theater. He has wallpapered the upper floor of the theater in a print that resembles Where's Waldo? meets, say, Marcel Dzama. The cool thing is he has also put up the print on buildings around the theater. Perhaps the scaffolding hints at more art to come? Cinema Tuesdays at the theater. around for three months. It's hard to describe all the cool things going on inside -- a combination ofsportsware and art and cinema and local outreach. If you're in the area, you're strongly recommended to stop in. Scenes From Opening Night of the Art Show at Small Bills. Last night was the opening of a showing at Small Bills (8200 1/2 W. 3rd Street; website here). We showed up to check out some art, buy some prints, listen to some music, and of course, drink some free Colt 45. Here's a print featuring the artists who contribute to the show. The space is small, but is painted with these awesome fossilized griffin-looking things. Here's some art. (Left: Skullphone; Right: Shepard Fairey). Years after high school and the cool kids still just wanna hang out in parking lots. One of the biggest things that we miss about living in the Bay Area are lazy weekend afternoons hanging out in Tomales Bay eating oysters, drinking white wine, and eating cheese from Cow Girl Creamery. We were not prepared for the dearth of oyster eating options in Los Angeles, but luckily one of the best places for oysters in LA is near us: The Hungry Cat. We spent a recent, beautiful, lazy Hollywood weekend trying to recreate our Northern California oyster days. The Hungry Cat is also known for its interesting drink list. After our stomachs were sufficiently greased up we moved on to the main attraction. One Final Obey Blast (For Now At Least). So we've been on a Shepard Fairey posting kick lately, and we thought we'd just clear our camera of all Obey-related pics today. So join us on a tour of Los Angeles, Obey-style. First up, is Studio Number One, his studios and Obey HQ, located at 1331 W. Sunset Blvd. in Echo Park. Here's a shot of people lined up on a recent Saturday morning waiting for the release of a new print. This is the East side view of the studio. Heading West on Sunset, next up is the Brooklyn Projects skate shop located at 2125 W. Sunset Blvd.. The shop features an entire Obey wall. Continuing a bit west on Sunset is this Obey facade. 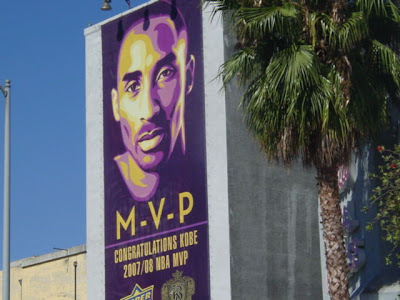 Making your way into Hollywood you'll find this Shepard Fairey Kobe Bryant piece, commissioned by Upper Deck. Looping back around, you will find tucked away in a makeshift alley on Melrose and Hobart these flower guns. Finally, the intersection of Stadium Way and Riverside Blvd. (Riverside Blvd is a new discovery for us; we imagine we'll spend a lot more time exploring this street in the near future.). This first print says: "World Police State Champs, More Militerry, Less Skools." The view from last night's walk from Blue Palms Brewhouse (verdict: recommended) to our place in Beachwood Canyon. So today we're gonna continue on our art kick. Our friend Fellow Blogger -- we always just bold her name rather than link to her as she refuses to allow us to ever link to her blog because she's obsessed with "anonymity" and insists that she will be "fired" [note: it's doubtful whether she's even employed] by the mere act of our linking to her [aside: remember when people used to call links hyperlinks? Also: Hypercolor. People used to wear that. We submit that hyperlinks and hypercolor need to make a comeback] -- introduced us to the artwork of Banksy shortly after we relocated to Los Angeles [and probably after a night of us talking her ear off about our love of Shepard Fairey's work]. This introduction was a good thing and a bad thing. A good thing because his art is pretty and funny and insightful and just shows up on walls out of nowhere with no prior warning making it an all-around cool and necessary thing. But the intro was a bad thing, too, because as it is we're pretty suspect at driving, and now when we're driving, our eyes are constantly wandering off the road, looking for Banksy pieces, rather than concentrating on not smacking into the person in front of us. Here are four pieces we've been able to find. Banksy Girl. This one is found at the Valero gas station at the corner of La Brea and Beverly. Banksy Gardener. Same location as above. Banksy Caveman. This one is found by the New Beverly Cinema, 7165 Beverly Blvd. Bansky Rat. This one is on Melrose, just West of Orange Dr. This is our favorite piece we've spotted thus far. To give you a sense of it's size, here's a picture from the north side of Melrose. The rat's gotta be 10 feet tall. 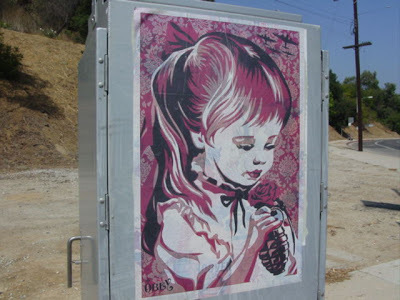 If you know the locations of any other LA Banksy pieces, please write in to let us know!